Leading Manufacturer of pe manholes from Mumbai. Manholes Inspection Chambers made to EN13598 standards in internationally accepted design are available in sizes ranging from 400mm to 1200mm. 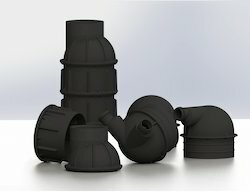 The Manholes are manufactured using Roto Moulding Technique and are widely used due to their durability, light weight and easy installation. HDPE Manholes provide easy flow of media and has high resistance to bacteria and temperature. The Manholes are environment friendly as there is no ex-filtration or in-filtration. They have zero maintenance charges and can be used for decades to come. Looking for Plastic Manhole ?